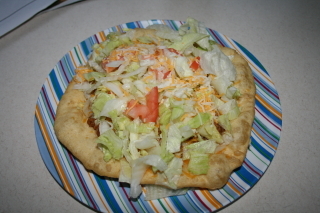 This recipe is for the Shoshone-Bannock Tribe version of Indian fry bread prevalent in the Pocatello, Idaho area. With the addition of prepared taco meat, lettuce, cheese and tomatoes, the fry bread is instantly transformed into Indian tacos. All over the Southwest you will find local variations. Some examples would include green chilies or beans. Dessert fry bread can also be found, perhaps slathered with honey of a coating of sugar and cinnamon. The bread also makes an excellent bun for hamburgers. In a large bowl, mix the dry ingredients together. Add water and knead until soft but not sticky. Cover with plastic wrap and allow to rest for an hour in the refrigerator. Divide dough in equal quarters. Each quarter will make two tacos. Divide the dough and roll each portion in to a smooth ball. Stretch and pat dough, or use a rolling pin, until thin and circular, about 1/4-inch thick and about the size of a saucer (for hamburger buns, make the tacos half size, one each for top and bottom bun). Traditionally, the Bannock people poke a hole, a steam vent, in the middle of the pieces with their finger before cooking. Cook in hot oil, about 350?F, until golden, turn and cook second side until golden brown, about 2 minutes per side. Remove from pan and drain on paper towels. Wrap in towel to keep warm until ready to serve. To make basic Indian tacos, add a layer of taco seasoned meat, a layer of lettuce, tomatoes, then a layer of shredded cheese, either Cheddar or Monterey Jack cheese do nicely. The Indian taco had become a staple at Indian pow wows and shows up at many summer events including rodeos and fairs. Fry bread became opart of the Indian culture about 1860 when the Navajos were imprisoned at Fort Summer and only provided with some flour and lard for provisions. 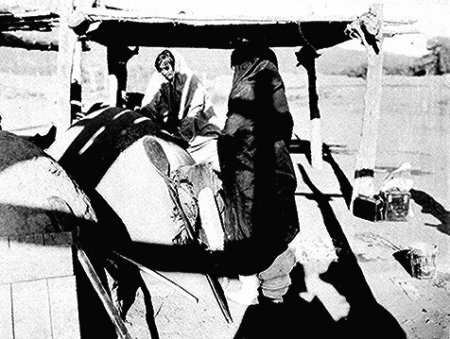 The Indian adapted and Navajo bread was born. The dish has been widely adopted by many other tribes. For more information on the history of fry bread, see and informative page on fry bread provided by OSO-ONO Foods.